North Portland minimizes flooding with a system that includes a combination of Levees (dikes) and sloughs (drainage channels) near the Columbia River. Some 45 miles of levees reduce the risk of flooding from the Columbia River while the sloughs help drain water from the land. The Multnomah County Drainage District helps protect lives and property from flooding by operating and maintaining stormwater and flood management systems for over 1200 acres of land along the Columbia Slough and the lower Columbia River. 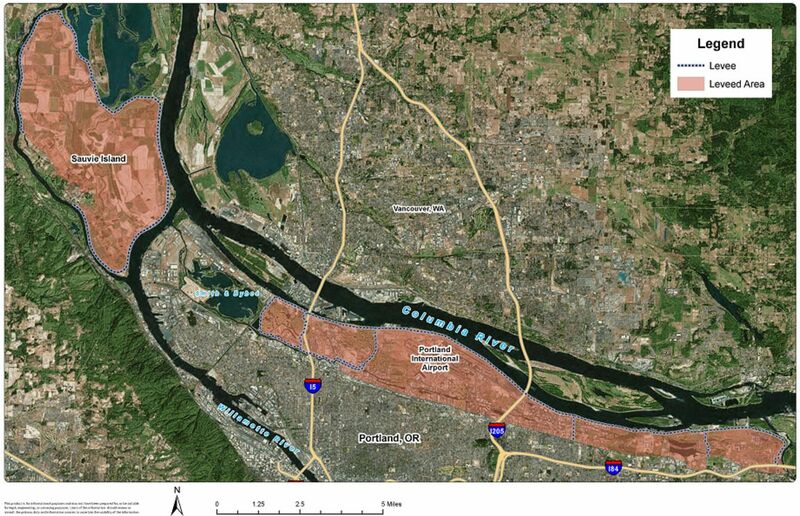 The levees run from North Portland to the Sandy River and large parts of Sauvie Island. The levees are maintained by over 20 organizations committed to a collaborative approach to floodplain management. Levee Ready Columbia — the umbrella organization seeking to re-certify an aging system of earthen barriers along the Columbia River — is facing a budget crunch because state lawmakers didn’t pay their share, reports the Portland Tribune. Since Katrina the Corps of Engineers has revised standards for flood-control systems. “But only 121 out of 1,451 U.S. flood-control systems have earned ‘acceptable’ ratings so far in the first national inventory—ordered after Hurricane Katrina—and the Columbia River levee isn’t among them,” reports Steve Law of the Tribune. Levee Ready Columbia is a partnership of over 20 organizations with communities in Portland, Gresham, Fairview, Troutdale, Interlachen, and Sauvie Island directly benefiting from flood reduction. The levee system reduces flooding for local residents and protects assets such as the Portland International Airport and the Columbia South Shore Well Field, which provides drinking water for 800,000 Oregonians and is a backup for the Bull Run watershed. The Columbia Slough is a narrow waterway, about 19 miles long, in the floodplain of the Columbia River. The Columbia Slough is a remnant of the historic wetlands between the mouths of the Sandy River to the east and the Willamette River to the west. The 19-mile-long Columbia Slough, the remnant of an old wetland, is controlled by floodgates and pumps. It reduces the possibility of catastrophic flooding and lowers insurance costs for landowners. Re-certification of levees is required every 10 years by the Federal Emergency Management Agency so property owners can qualify for flood insurance. The nearby Multnomah Channel (Willamette Slough), below, travels along the south side of Sauvie Island, beginning near the west side of the Willamette, near Kelly Point Park, at the confluence of the Willamette and Columbia Rivers. It re-enters the Columbia near St. Helens. There are 12 pump stations operated and maintained by the Drainage Districts. The Columbia Slough Watershed Council is a diverse group of neighbors, property owners, businesses and government agencies who work to restore and enhance the 60 miles of waterways known as the Columbia Slough. Their annual Columbia Slough Regatta at the St Johns Launch (9387 N Columbia Blvd) in August provides canoes and kayaks to launch into the safe slack water of the Columbia Slough. As part of the Columbia Slough Watershed, a new Sewer Pump Station is being installed in the Safeway parking lot. The new Safeway Pump Station on Hayden Island will house two larger pumps, to reduce the possibility of sewage releases into rivers, homes and businesses. Kenton’s northern border is formed by North Portland Harbor, the channel of the Columbia River that separates Hayden Island from Oregon’s mainland. The Bridgeton Neighborhood is on North Portland Harbor which some people confuse with the slough. North Portland Harbor was previously called the Oregon Slough, but it is really just the south section of the Columbia River. The west end of the Columbia Slough is at Kelly Point Park, near the Port’s Rivergate Industrial District, south of Hayden Island. The Columbia Slough is about one-half mile south of the Columbia River and runs parallel to it, running past Smith and Bybee lakes and Portland International Airport. A bike path travels along much of the Slough. Sewage flows downhill through pipes called gravity sewers in most of Portland’s collection system. The Columbia Boulevard Treatment Plant serves nearly 600,000 residential and commercial customers. Pump stations are located at low points in the system to pump wastewater uphill. The North Portland Peninsula railroad tunnel, near N Columbia Blvd (north portal), shortens freight movement north over the Columbia River to Washington State. The Slough largely parallels The Kenton Line, which feeds UP traffic to the Port of Portland. Terminal 5 features a grain elevator operated by Columbia Grain and a potash export facility in a 2,000-foot-long storage building run by PotashCorp, while Terminal 6, along North Portland Harbor, specializes in containers and cars. Levees surround much of the main slough as well as many side sloughs and nearby lakes. The region’s 4 Drainage Districts operate 13 Pump Stations, 27 Miles of Levees, and approximately 45 Miles of Ditches, Slough, and Streams. Employees control water flows with pumps and floodgates. During the early 1920s, levee construction began to prevent the Columbia River’s annual spring floods. As the area developed, what was once a wildlife-rich mosaic of sloughs, wetlands and lakes was transformed into a highly managed system of channels, agricultural lands, industrial development, and residences. One of the nation’s largest freshwater urban wetlands, Smith and Bybee Wetlands Natural Area shares the lower slough watershed with The Portland Expo Center, Portland’s marine terminals, the Columbia Boulevard Treatment Plant, a Heron Lakes Golf course, Portland International Raceway, Delta Park and Historic Vanport. Vanport was dramatically destroyed at 4:05 p.m. on May 30, 1948, when a 200-foot (61 m) section of the dike holding back the Columbia River collapsed during a flood, killing 15. The break in the dike was west of the current Portland International Raceway, along the North/South Railroad birm. Vanport at the time was the second largest city in Oregon, with a population about 18,500. The city was wiped out. The areas levees must now be accredited within FEMA’s National Flood Insurance Program by drilling boreholes and removing soil samples at periodic intervals along the levee system. Vanport Mosaic Trailer from Vanport Mosaic on Vimeo. THE VANPORT MOSAIC IS AN EFFORT TO COLLECT AND SHOWCASE ALL OF THE STORIES, ART, COMMUNITY PROJECTS AND MEDIA BEING PRODUCED AROUND THE STORY OF VANPORT AND TO ENSURE THAT THIS PIECE OF OREGON HISTORY IS NOT FORGOTTEN. The Columbia Slough collects stormwater runoff, rainwater, and groundwater. Its streams, sloughs, wetlands, grasslands and woodlands provide wildlife corridors and migratory routes for over 175 species of birds. Mink, river otter, beaver, coyote and sensitive species like Bald Eagle, Peregrine Falcon, Willow Flycatcher, and Western Pond and Painted turtles use slough habitats. Twenty eight fish species call the Columbia Slough home. The Columbia Slough Regatta is held annually in August. The public is invited to paddle along the slough with boats available at no charge. Biking along the Slough and Smith and Bybee Lakes is pleasant and part of the 40 mile loop around the city. McCuddy’s Marinas extend from Government Island to Ridgefield.